Sega have been on a bit of a streak with their support of Sonic Runners since the game launched worldwide. 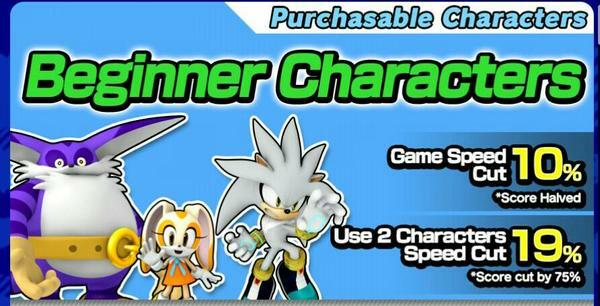 New content and events have been a monthly occurrence, in fact, Sega have just added three new characters to Sonic Runners which you can actually buy through the character select screen as opposed to gambling via roulette wheel. Big the Cat, Cream and Silver have been added to the game, however they come with some very unique abilities. For starters, fans have already dubbed these characters easy mode, due to the fact that they cut the speed of the game by 10% if you use a single character, or 19% if you use two. However, as a consequence, they also cut your score by either 50% or 75% depending if you use two or not. Sega have said these are designed for new players who may not be used to the high speed sections in the game. However, those new players will have to spend money in order to get them. Each of these characters costs 250 red star rings to unlock, or 5 million golden rings. Are you still playing Runners? How you finding it? Let us know in the comments. 250 Red Rings is rather pricey. But I’m determined to get that amount without spending an actual penny. Probably going for Silver first. Same. Although I probably won’t play as him much due to the score cuts. All, i can say is that this is a rip off. It’s not as bad as trying to get characters off the roulette but come on sega. It’s as bad as the Amy Rose 10 Invites from Facebook, It’s impossible for me to do because, no one on my facebook doesn’t care about sonic. I like Sonic Runners but, they expect the hardest of things. Sorry for typo, “No one on my facebook cares about sonic.” is what i mean. Silver is one of my favourite Sonic characters, so it pains me to see that his use comes at a cost. Why couldn’t they have just added in a difficulty option which does the same thing instead of screwing over characters people want to use? Seriously? They FINALLY do what everybody said they should have been doing in the first place, make new characters PURCHASABLE rather than having to use a stupid roulette wheel to get them, but what do they do? Not only put such a steep price on “beginner characters”, but they also turn them into a penalty! Why would you do that!? Silver is one of my favorite characters, and it IRKS me to no end to have to feel like I’m being punished just for playing as a character I WANT to play as and for getting him in a much more guaranteed method than gambling all day! And again, they’re marketing them as “beginner characters”? How the hell is that supposed to work!? The speed difference aside, there’s no reason they should be considered this way. If a new player has to spend 250 Red Star Rings or 5 MILLION FREAKING GOLD RINGS just to get ONE of these “beginner characters” then guess what they’re going to have to do? That’s right, they have to freaking play the game with the insanely fast characters in order to make that kind of money at all, so there’s virtually no point in making characters that purposely cut the game’s speed in half, it only frustrates the player if it means loosing half your score. And unless you were going to make some kind of event where Red Star Rings or just Rings in general are insanely easy to get a hold of, then there’s no point in making something that’s supposed to be “accessible to new players” like “easy mode” if they have to play hard mode in order to get the money to play what’s supposed to be their training wheels course! That’s like taking a field trip of toddlers to a ski resort and saying “Oh well kids, the gondola is out of service, and the only way to get to the Bunny Slopes is to go down the Thrill Seeker Slopes. Follow me, it’ll be FUN! You’ll all (probably) be safe! Oh, and that will be $50 each.” I don’t know how they did it, but Sega managed to find a way to take something I had been hoping to be integrated in this game in the first place and make it even worse than the roulette wheel. It’s stupid, I even find that Amy Rose Facebook challenge to be stupid, want to know why? My friends don’t care about sonic so i find it completely impossible to even get the character. I agree. This is the worst decision for Sega to make. If they wanted to make it easier,then they would’ve given us an easier way to get them,and less expensive. …Oh it all better be freaking going towards the 25th Anniversary, I swear to God.. I want my Amy ,that’s it okay! I’m want to purchase Amy rose, not sign up on some social sites. just stockpiling my red rings for when metal sonic is added to the game. Why is Silver a speed type all of a sudden? They could have just added Shadow first, then. Makes me wonder what Blaze or Metal Sonic is going to be. I think that it’s because he runs slower… Like in Sonic 06, he was not as fast as Shadow and Sonic, and now, in Sonic Runners, he’s a beginner character, so the vitess of the game will be slower and that will, in some fact, respect Silver’s vitess of run! Well, it’s my opinion, but it’s logic! He still wasn’t as fast as Sonic or Shadow, but you get the point. I still find the game fun but that’s probably cause I got a head start on the game before the worldwide release. I got the red rings but I don’t have 5 million rings. Might get them for collection purposes though. I can see Big and Cream being beginner characters…but Silver? One of the characters I was hoping for is expensive and is a major handicap. Man, the way of having extra characters in this game is complete trash. I might as well stick with the main three for possibly as long as I have the game, because the wheel is steel refusing to give me Rouge and Omega. Now watch Shadow get added only to make the game five times harder just by playing as him. I have been waiting for Cream since the beginning. Shame she’s casual mode (Sonic advance 2 is my favourite iteration of her) but hey, at least I don’t have to go through the roulette. Hope the rest of the characters are purchasable as well, will save 250 red rings for when Blaze is available. Also I wonder if Blaze, Shadow and Metal Sonic will be Expert Characters.